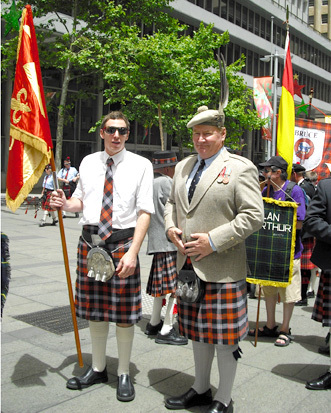 Sir Wayne Broun of Colstoun, Chief of the Name and Arms of Broun, and SAHC Patron, about to lead his clan in the St Andrew's Day celebration march. on the closest Sunday to 30 November. See the SAHC calendar for the actual dates of the service. St Andrew's Presbyterian Church, State Circle, Forrest, Canberra ACT. This event is a part of the International St Andrew's Day celebrations for 30 November. Click here for more about the history of St Andrew (a new webpage will open).